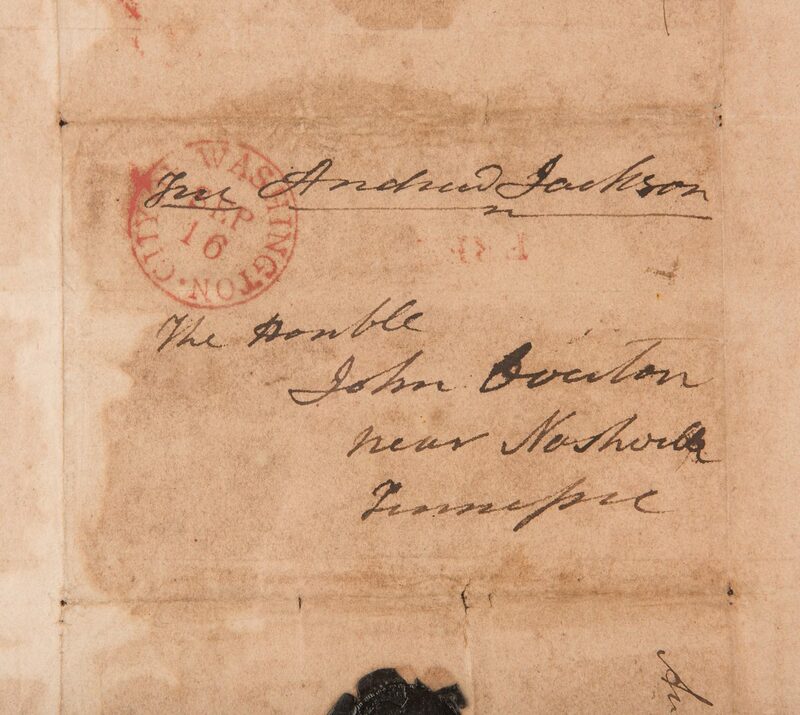 2 articles of Presidential correspondence between Andrew Jackson and Martin Van Buren and their mutual friend, Judge John Overton of Nashville, co-founder of Memphis and owner of Traveller's Rest Plantation. 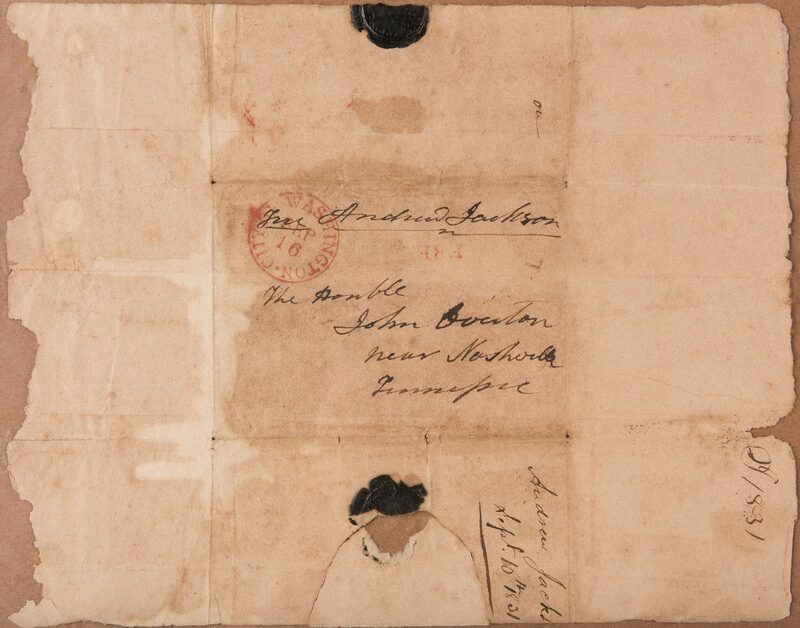 1st item: Framed Andrew Jackson Free Frank – envelope addressed in the hand of Andrew Jackson to "The Hon'ble John Overton Near Nashville Tennessee", and dated Sept. 10th 1831 with additional red Washington postmark and Free stamp. 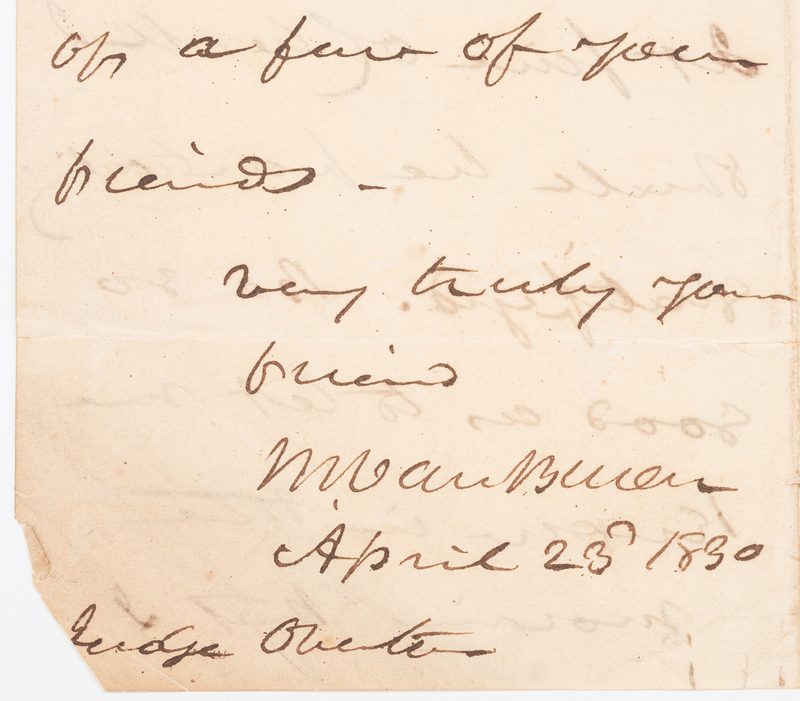 (Jackson was President of the United States from 1829-1837. 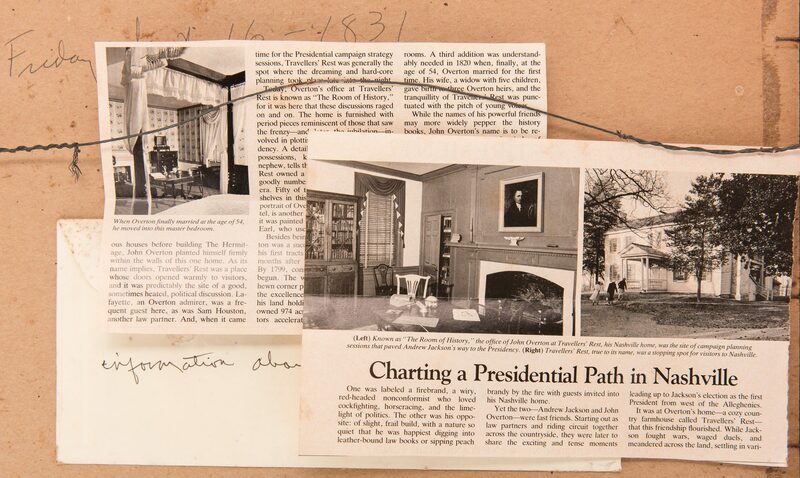 During his terms in office, he was able to send letters "free of frank" – without affixing stamps or postage). 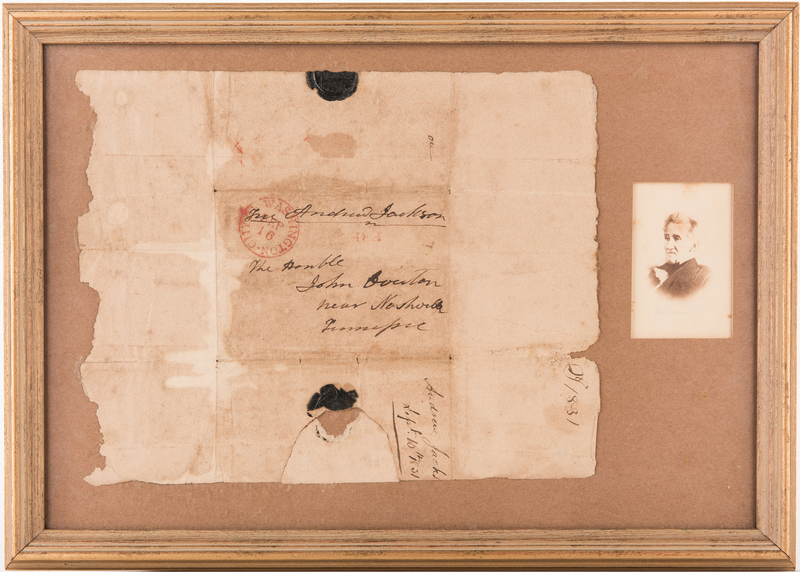 Float mounted on a buff mat and framed under glass along with a CDV of Jackson after the photograph by Matthew Brady taken in 1845. 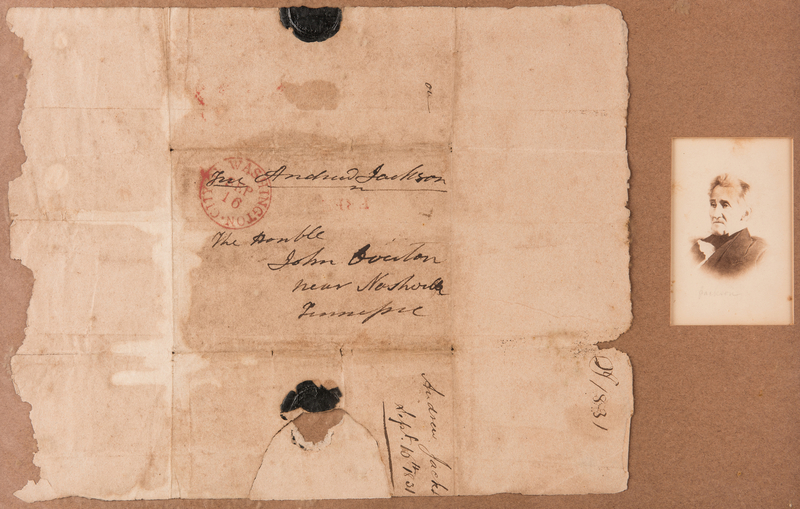 Envelope – 11" x 9". Framed – 17 1/2" x 12 1/2". 2nd item: Martin Van Buren ALS , short letter to Judge John Overton, dated April 23, 1830: "My dear Sir, If you can consistently with your arrangements and personal comport do me the favour to dine with me on Wednesday next at five o' clock I shall be __ gratified. 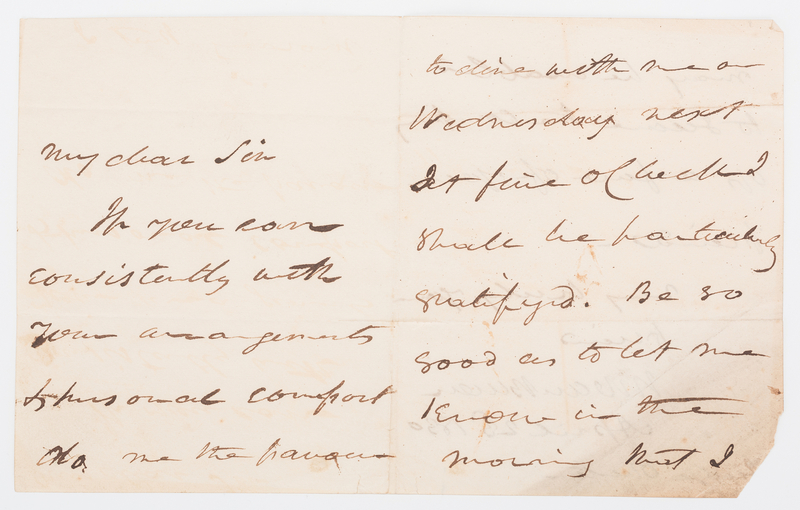 Be so good as to let me know in the morning that I may be enabled to secure the company of a few of your friends. Very truly your friend, M. Van Buren". 8" x 5". Note: Martin Van Buren (1782-1862) was the United States of America's eighth President from 1837-1841. 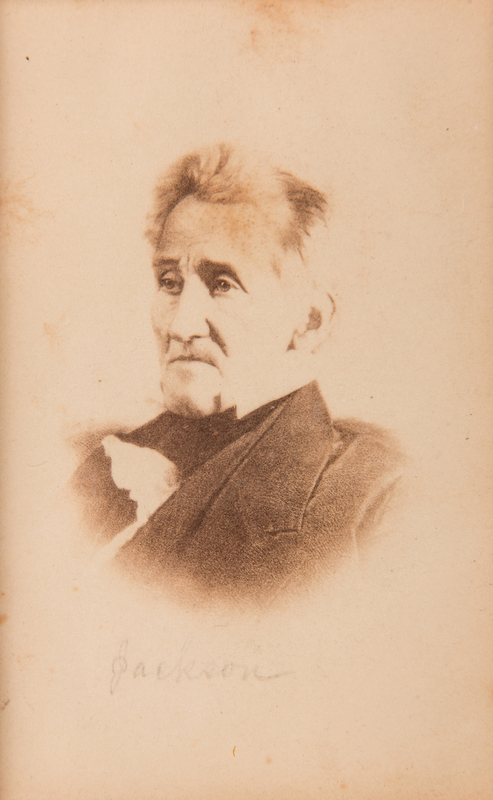 He and John Overton (1766-1833) were both friends and advisors to President Andrew Jackson. 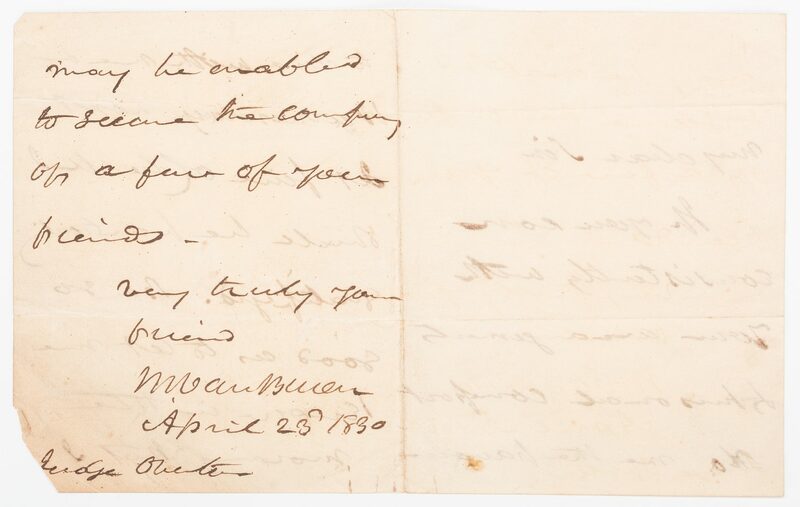 Van Buren was U.S. Secretary of State when this note was penned. 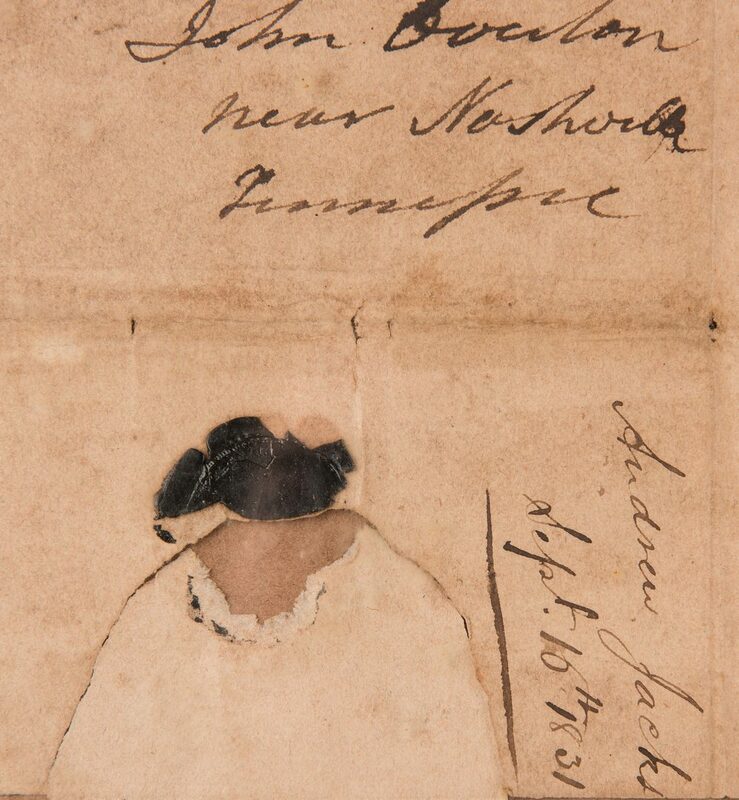 Provenance: The collection of internationally known ragtime pianist and music historian Johnny Maddox, Gallatin, TN. CONDITION: 1st item: Envelope partially glued to backing. Tear and 1" loss near black seal at lower edge, overall discoloration and light staining. 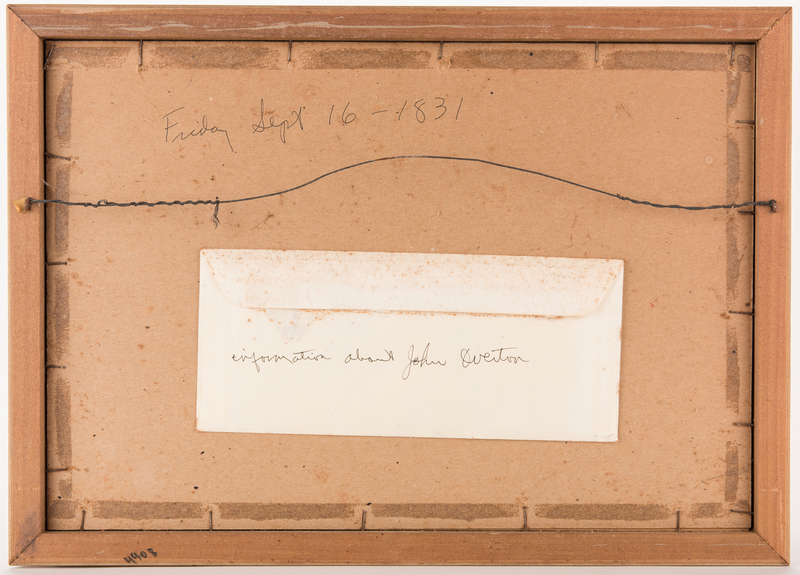 CDV has "Jackson" written in pencil underneath. 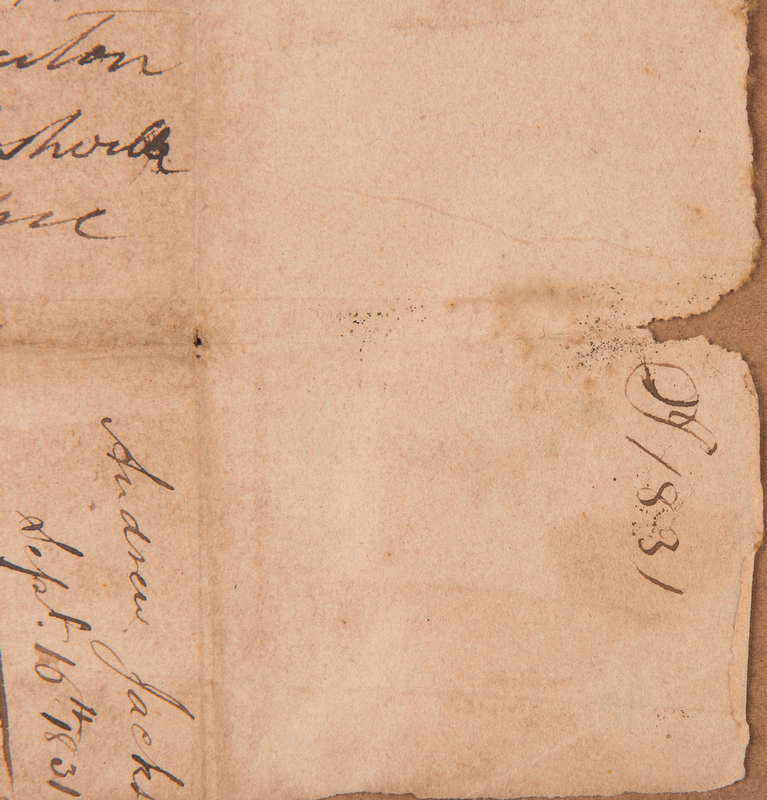 2nd item: Toned, separations at fold lines, couple small spots of foxing. Crease, dampstaining and 3/4" loss at lower right corner, affecting the "J" in "Judge Overton" .